Note: The long-cherished neocon dream of “regime change” in Syria is blocking a possible route out of the crisis – a ceasefire followed by elections in which President Assad could compete. The problem is there’s no guarantee that Assad would lose and thus the dream might go unfulfilled, writes Robert Parry. Even that was too much for Ahrar al-Sham, one of the principal jihadist groups fighting side-by-side with Al Qaeda’s Nusra Front, the two key elements inside the Saudi-created Army of Conquest, which uses sophisticated U.S.-supplied TOW missiles to kill Syrian government troops. Ahrar al-Sham announced its withdrawal from the Riyadh conference because the meeting didn’t “confirm the Muslim identity of our people.” Syrian President Bashar al-Assad has sought to maintain a secular government that protects the rights of Christians, Alawites, Shiites and other religious minorities, but Sunni militants have been fighting to overthrow him since 2011. Despite Ahrar al-Sham’s rejection of the Saudi-organized conference, all the opposition participants, including one from Ahrar al-Sham who apparently wasn’t aware of his group’s announcement, signed the agreement, the Times reported. “All parties signed a final statement that called for maintaining the unity of Syria and building a civil, representative government that would take charge after a transitional period, at the start of which Mr. Assad and his associates would step down,” wrote Times’ correspondent Ben Hubbard. But the prospects of Assad and his government just agreeing to cede power to the opposition remains highly unlikely. An obvious alternative – favored by Assad and Russian President Vladimir Putin – is to achieve a ceasefire and then have internationally supervised elections in which the Syrian people could choose their own leaders. Secretary of State John Kerry told reporters on Friday that he was in contact with senior Saudi officials and noted, “there are some questions and obviously a couple of – in our judgment – kinks to be worked out” though expressing confidence that the problems could be resolved. A key problem appears to be that the Obama administration has so demonized Assad and so bought into the neocon goal of “regime change” that Obama doesn’t feel that he can back down on his “Assad must go!” mantra. Yet, to force Assad out and bar him from running in an election means escalating the war by either further arming the Sunni jihadists or mounting a larger-scale invasion of Syria with the U.S. military confronting Syrian and now Russian forces to establish what is euphemistically called “a safe zone” inside Syria. A related “no-fly zone” would require destroying Syrian air defenses, now supplied by the Russians. Obama has largely followed the first course of action, allowing Saudi Arabia, Qatar, Turkey and other Sunni “allies” to funnel U.S. weapons to jihadists, including Ahrar al-Sham which fights alongside Al Qaeda’s Nusra Front as the two seek to transform Syria into a Islamic fundamentalist state, a goal shared by Al Qaeda’s spinoff (and now rival), the Islamic State. Despite these risks, Obama continued to insist that “Assad must go!” and let his administration whip up a propaganda campaign around claims that Assad’s forces launched a sarin gas attack outside Damascus on Aug. 21, 2013. Though many of the U.S. claims about that attack have since been discredited – and later evidence implicated radical jihadists (possibly collaborating with Turkish intelligence) trying to trick the U.S. military into intervening on their side – the Obama administration did not retract or clarify its initial claims. 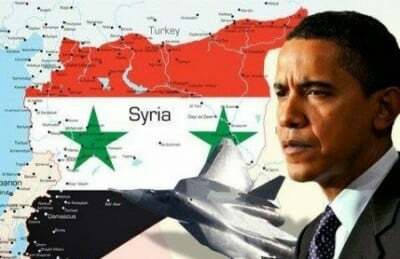 By demonizing Assad – much like the demonization of Russian President Putin – Obama may feel that he is deploying “soft power” propaganda to put foreign adversaries on the defensive while also solidifying his political support inside hawkish U.S. opinion circles, but false narratives can take on a life of their own and make rational settlements difficult if not impossible. Now, even though the Syrian crisis has become a tsunami threatening to engulf Europe with a refugee crisis and the United States with anti-Muslim hysteria, Obama can’t accept the most obvious solution: compel all reasonable sides to accept a ceasefire and hold an internationally supervised election in which anyone who wants to lead the country can stand before the voters. If Obama is right about the widespread hatred of Assad, then there should be nothing to worry about. The Syrian people will dictate “regime change” through the ballot box. Democracy – supposedly one of the U.S. government’s goals for Middle East countries – can be the answer to the problem. However, since democracy can be an unpredictable process, it might not guarantee “regime change” which apparently makes democracy an unsuitable solution for Syria.